The next iteration of SoundSpace is inspired by the new exhibition Words/Matter: Latin American Art and Language at the Blanton. 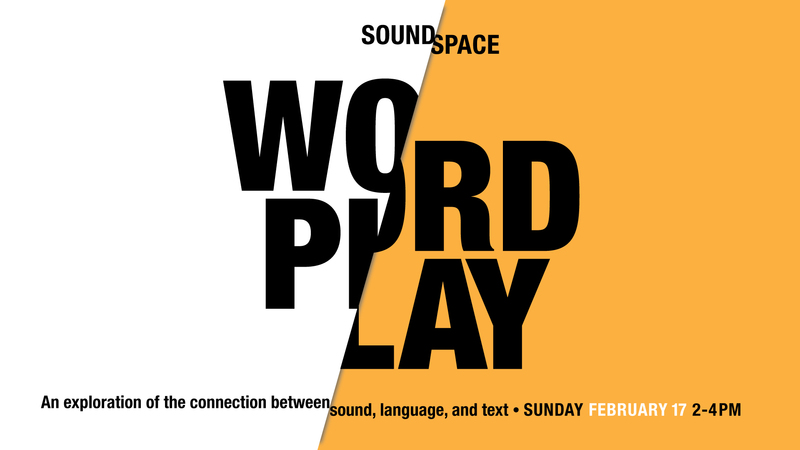 SoundSpace: word/play will explore the various ways artists employ connections between sound, language, and text. The program will feature performances that utilize hand-made rubber water hoses with audio clips describing childhood memories; a dance and spoken word piece that explores the onomatopoeia through the physical embodiment of vocalized text; and performances by Octopus Project, Grageriart, Yuliya Lanina, Adrian Aguilera and Betelhem Makonnen, Sonya Gonzales, Annelyse Gelman, Alexa Capareda, and Tamara Johnson. – The Octopus Project is an Austin-based band who have been recording and touring since 2002. While perhaps best known for their rock band+electronics+multimedia stage show, this performance is the latest in a series of site-responsive multi-channel sound explorations that the group have been developing in their most recent work. This semi-improvised piece is inspired by the structures of concrete poetry, using recorded voices and a quadraphonic sound system to create patterns of sound within the gallery space. – Pulling from histories, literature, and diasporic time travel, Adrian Aguilera and Betelhem Makonnen create works informed by an immigrant’s perspective of constant translations within multiple realities. Their projects operate on relationality -– prioritizing inter/intra-connections, both spatial and temporal, between the work, the audience and the environment. “History never really says goodbye, history says, see you later.” Eduardo Galeano. Bringing to light a 1978 text by the radical Latin American journalist/poet/thinker Eduardo Galeano, written in a context of dictatorship, censorship, and wanton abuse of Indigenous peoples, in defense of the wor(l)d (a través de Galeano) visualizes his still relevant call for a different wor(l)d, a wor(l)d deserving to be what the wor(l)d wanted to be when it was a different wor(l)d, a wor(l)d deserving to be what the wor(l)d wanted to be when it was not yet born. – Misread Signs is an audiovisual performance by Yuliya Lanina. It will feature Lanina’s performance with projected animation based on Lanina’s paintings and accompanied by original music composition by Colombian-born composer José Martinez. As a sole sound source, José Martinez will be using Lanina’s voice manipulated in real time. – Sonya Gonzales is a sound artist from Austin, Texas. A recent graduate of Goldsmiths University Sonic Arts program, her live work centers around found-sound and improvisation within a minimal aesthetic. For this performance, she will be exploring sound art as an empirical subject, using live sounds to create an improvised piece. – Annelyse Gelman‘s language-based works have appeared in a neuroscience lab in San Diego, an art gallery in Berlin, a movie theater in Vienna, and many publications, including BOMB Magazine and The New Yorker. Her SoundSpace performance, written specifically for The Blanton, is an investigation of bodies and borders and touch. – Alexa Capareda is a classically-trained contemporary dance artist, Rehearsal Assistant for Ballet Austin II, Co-Producer with Frank Wo/Men Collective, and has worked with Performa/Dance, ARCOS, BLiPSWiTCH, Magdalena Jarkowiec, and Jennifer Sherburn. Her works have been featured in collaborations with sound artists/musicians Steve Parker, Brent Baldwin/Panoramic Voices, Lynn Lane/Transitory Sound and Movement Collective, and Austin Camerata. Swish Swizzle Smack is a part-choreographed, part-improvised, part-spoken word dance piece that plays on onomatopoeia. In the same way that onomatopoeic words mimic sounds, dancers physically describe and attempt to embody the vocalized text. – Tamara Johnson is an artist who works in a variety of mediums and materials from cast concrete to robotic grass. This new work present at SoundSpace, Family tree, combines hand-made rubber water hoses with audio clips from Johnson’s immediate family describing childhood memories, family indiscretions, and secret dramas. Johnson graduated from the University of Texas at Austin in 2007 and received her Masters from the Rhode Island School of Design in 2012. She currently teaches at Southern Methodist University (SMU), started Sweet Pass Sculpture Park with her partner, Trey Burns, and has a garage studio in her back yard in Dallas, TX. Heralded by the Austin American-Statesman as “The most successful new music event in the City,” SoundSpace is a dynamic concert series that brings together musicians and other creatives to connect visual and sound art. Now in its eighth year, the series demonstrates the Blanton’s commitment to nurturing collaborations that provide innovative experiences with art, inspire creativity, and support the educational mission of The University of Texas at Austin. Tag your experience on social media with #blantonsoundspace! SoundSpace is directed by Steve Parker of Collide Arts. COLLIDE is generously supported in part by the Cultural Arts Division of the City of Austin Economic Development Department, the National Endowment for the Arts, the Texas Commission on the Arts, The Aaron Copland Fund for Music, Inc, the Texas Music Office, and the Mid America Arts Alliance.